Shall we go on a little trip? I know I just wrote how much I love Fall, but that doesn’t mean that I don’t miss the beach. I had a lot of beach this summer. We went to the tropical island of Bali in Indonesia for our summer vacation. And it was beautiful and so worth it. I know that summer is over, but I just couldn’t resist looking back a bit and share this with you all. Indonesia was a new experience for us and one we truly loved. The island is beautiful. Of course it has a lot of beaches. Most of them with beautiful blue water and soft sand and in some spots with challenging waves. The inland of the island has lush forests, a gazillion rice paddies and volcano mountains with lakes and waterfalls. We walked and walked for hours each day. Sometimes just on busy roads filled with so many mopeds you just can’t imagine and that were lined with little shops and restaurants and massage parlors and beauty salons and moped repair shops and bars and temples. Oh the temples. Bali has its own version of Hinduism (the rest of Indonesia is mostly Muslim) and it is everywhere. Every village has at least three communal temples. Larger family homes have their own little temple. And every building and street corner has a mini temple. And they are all used, and little offerings are left everywhere multiple times a day. I can’t count the number of times we say a women or men walking by with a little dish of offerings on their way to leave it somewhere accompanied with some incense and holy water and a few prayers. Religion is very much a part of daily life on Indonesia. And it is all so colorful. The flowers, oh the flowers. They are everywhere in abundance. And they are used. Women would wear them in their hair, no little offering to the gods was without flowers, statues were decorated with flower garlands, restaurant steps would have carpets of flowers and in just about every hotel room someone would have left a flower on our pillow. Nature sure is giving in Indonesia. But the colors were also there in the festive clothes people wore. When we arrived on a Thursday it happened to be a holy day. So everywhere in town people were dressed up in (what we would call our) Sunday clothes and on their way to the temple to celebrate together. When going to temple a sarong is mandatory for men and women and they were all made in the most beautiful colors and patterns. I remember standing there on the corner of that road. Just taking it all in. The crazy business of traffic, whole families sharing one moped, the kids squeezed in between mom and dad and mom carrying offerings in both hands. The moped parking lot with hundreds and hundreds of mopeds. The women carrying baskets with offerings to the temple on their head. The white (lace) blouses (white being a holy color) contrasting with the colorful sarongs, sashes and head gear. We stood there on that corner, very much out of place, very much a tourist with the camera around our neck and backpacks on our back. We stood there very much in the way of all those people on their way to temple. And they all smiled at us. They all gave us a curious look and smiled. A deep, friendly welcoming smile. Not a hint of “what are you doing here” in any of their faces, just a welcome. It made a deep, deep impression on me. It was my first experience in Bali and they won me over immediately. We spent the first day in Denpasar city. As I said it was a holy day, so we missed out on shopping and visiting the markets because everything was closed. 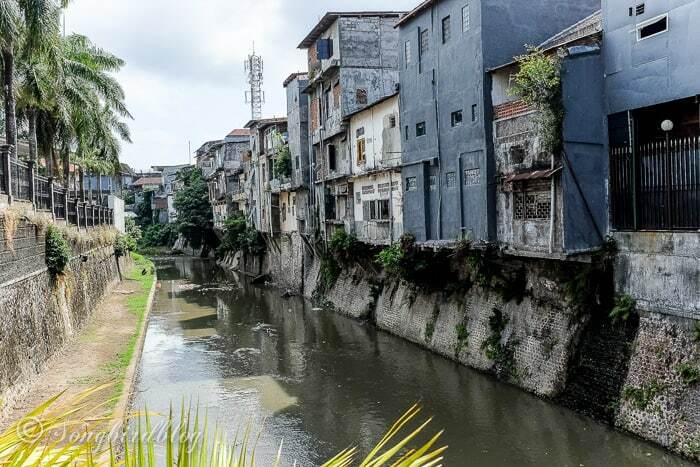 And Denpasar isn’t exactly a beautiful city. But it is real. This is where most people live their lives and we loved seeing this bit of ‘real Indonesia’ before we hit the touristy bits. But in all honesty we were glad to leave the city too. We were longing for the beach and we got it! This is were we started trying to get some of our Dutch pale skin accustomed to the feeling of sunshine. This is where we got up at 5.30 am to watch the sunrise. This is where we walked for hours along the coast line, just looking at the view and the fishermen trying to catch the meal of the day. This is where I sipped my first Mojito and fresh pineapple juice. This is where we got sand between our toes and sea salt on our lips. This is where my shoulders started to relax, my mind went quiet, my breathing became deep and this is where I exhaled. After the beach we hit the mountains and the lush green country side. The hotels and resorts we stayed in all seemed to just be a part of their surroundings, placed amongst rice paddies or tropical parks. Someone somewhere on Bali truly made the right decision. Early last century the first global tourists discovered Bali. At one of the beaches a large hotel was built, a high-rise of its time. And every one thought ‘this never again’, ever since there is a law that no building on Bali can be taller than a palm tree. Best decision ever! The coast lines and the mountain views are never obstructed and most buildings are built in traditional style and just seemed to be a part of the landscape. Ubud was the ‘mountain’ town we visited. It is a very busy but at the same time very relaxed little village. Very touristy, especially popular with the hip and alternative crowd. Health food and fruit juice bars, yoga studio’s and ‘get in touch with nature- tours’ everywhere. But also a beautiful country side and a special monkey forest. What is there not to love about an island like this? I hope you enjoyed this little tour to Bali. If you did, I might take you with me on the next part of our trip next week. There is so much more to see, I couldn’t squeeze it all in one post. Welcome back Marianne! I always miss your posts during your summer break! What a wonderful place to unwind after many months of hard work. I enjoy travels of others. Although my ancestors traveled here to America and traveled around before the land give away of thevHomestead Act, adventurers were they. Both sides. All four sets of great grandparents. But though I’ve moved a few times I don’t move much. I don’t travel lately so I peer into photo shoots and travel the world through the lens of another. My two dear friends have lived and currently live in Indonesia. My friend also went to Bali and shared photos. I jumped when you showed a monkey (ape?)!!!! My world explorer…yes!! Show us more!! I’m looking out on sunshine on my grapevine tumbling along my fence. My fountain reigns in silent glory as vivid orange and pink lantana tumbles around bushes and plants. The sky is pure blue as I peer out upon two of my tall cypress and gaze upon my neighbors curved clay tiled roof. It is quiet. A soft breeze and a relief from nearly 100F earlier this week when it was to be 92!!! A dead expensive spiral cypress in a tall cement pot. A sign of our drought. A couple lost plants. Yet other plants flourish for their roots are established. I can’t work on it like I did to maintain my own paradise. But I certainly look forward to the world’s rain forest paradise beaches and forests next post from you!!! oh my goodness… it looks and sounds so much like Hawaii! Yes, I want to see more! I’ve never left North America yet, so this is so intriguing! It looks amazing 🙂 I`ll definitely plan my vacation there.